These awesome people have made Misty's Heaven possible with contributions of pictures and information. Thanks for all your help! Kendy Allen: Thank you so much, you are a valuable source for us! Thanks for all the information and photos you have shared, as well as setting the story of Misty's legacy straight! We really appreciate it! Celina Boltinghouse: You were a great asset to this website! 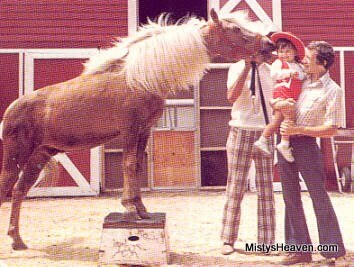 Thanks for shedding light on some of the Pony Farm history, as well as supplying us with countless photos! Some of these pony biographies wouldn't have been possible without your help, thank you! Lisa Christian: For sharing Misty III with everyone, and being so helpful during Pony Penning week, as well as providing photos and information! Kerra, Katye, and Kenneth Allen: For their friendship and allowing Matt to be part of the "family", as well as all the help, the rides, the fun, and whatever else! Dr. Sandy Price: For allowing Amanda to come and visit Twilight and Moon Shadow and spending time talking. Karen Lloyd: For the beautiful artwork of Misty that graces our home page, as well as much support for the initial building of the website. Marguerite Henry and Misty: For the story of Misty and its everlasting legacy, this site wouldn't exist without either of you!